It&apos;s 4:18 a.m. and the strip mall is deserted. But tucked in back, next to a closed-down video store, an employment agency is already filling up. Rosa Ramirez walks in, as she has done nearly every morning for the past six months. She signs in and sits down in one of the 100 or so blue plastic chairs that fill the office. Over the next three hours, dispatchers will bark out the names of who will work today. Rosa waits, wondering if she will make her rent. In cities all across the country, workers stand on street corners, line up in alleys, or wait in a neon-lit beauty salon for rickety vans to whisk them off to warehouses miles away. Some vans are so packed that to get to work, people must squat on milk crates, sit on the laps of passengers they do not know ,or sometimes lie on the floor, the other workers&apos; feet on top of them. The people here are not day laborers looking for an odd job from a passing contractor. They are regular employees of temp agencies working in the supply chain of many of America&apos;s largest companies—Walmart, Macy&apos;s, Nike, Frito-Lay. They make our frozen pizzas, sort the recycling from our trash, cut our vegetables, and clean our imported fish. They unload clothing and toys made overseas and pack them to fill our store shelves. They are as important to the global economy as shipping containers and Asian garment workers. Across America, temporary work has become a mainstay of the economy, leading to the proliferation of what researchers have begun to call "temp towns." They are often dense Latino neighborhoods teeming with temp agencies. Or they are cities where it has become nearly impossible even for whites and African-Americans with vocational training to find factory and warehouse work without first being directed to a temp firm. In June, the Labor Department reported that the nation had more temp workers than ever before: 2.7 million. Overall, almost one-fifth of the total job growth since the recession ended in mid-2009 has been in the temp sector, federal data shows. But according to the American Staffing Association, the temp industry&apos;s trade group, the pool is even larger: Every year, a tenth of all U.S. workers finds a job at a staffing agency. 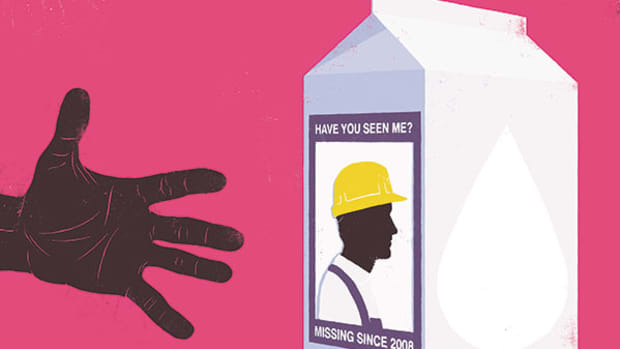 In December 2011, a Chicago temp worker died after he was scalded by a citric acid solution. The skin cream and shampoo factory he was assigned to failed to call 911 even as his skin was peeling from his body. The proportion of temp workers in the labor force reached its peak in early 2000 before the 2001 slump and then the Great Recession. 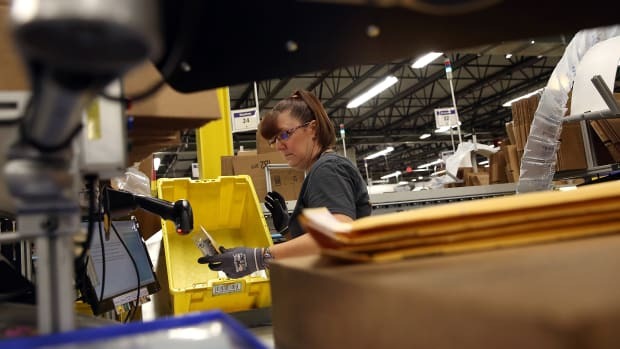 But as the economy continues its slow, uneven recovery, temp work is roaring back 10 times faster than private-sector employment as a whole—a pace "exceeding even the dramatic run-up of the early 1990s," according to the staffing association. 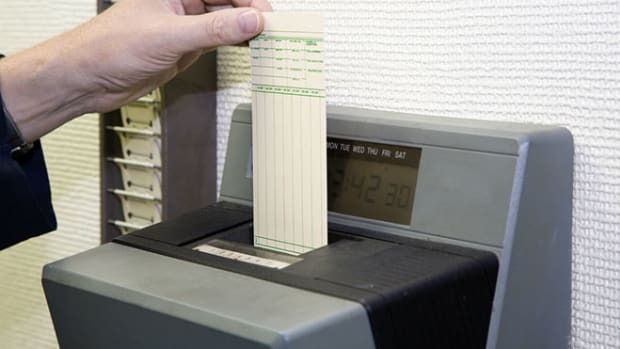 "We&apos;re seeing just more and more industries using business models that attempt to change the employment relationship or obscure the employment relationship," said Mary Beth Maxwell, a top official in the Labor Department&apos;s Wage and Hour Division. "While it&apos;s certainly not a new phenomenon, it&apos;s rapidly escalating. In the last 10 to 15 years, there&apos;s just a big shift to this for a lot more workers—which makes them a lot more vulnerable." The temp system insulates the host companies from workers&apos; compensation claims, unemployment taxes, union drives, and the duty to ensure that their workers are citizens or legal immigrants. In turn, the temps suffer high injury rates, according to federal officials and academic studies, and many of them endure hours of unpaid waiting and face fees that depress their pay below minimum wage. 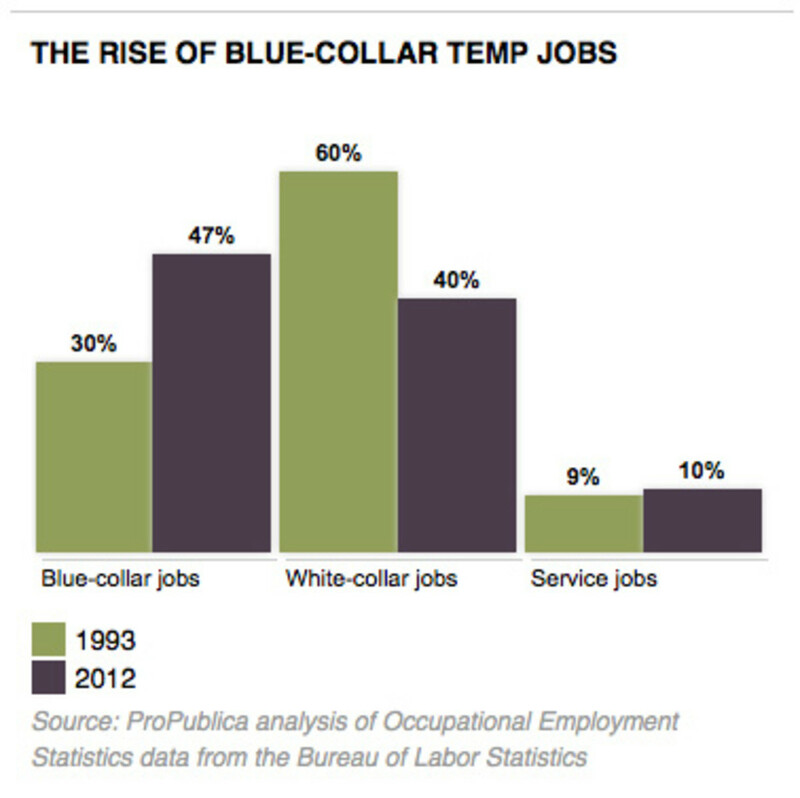 The rise of the blue-collar permatemp helps explain one of the most troubling aspects of the phlegmatic recovery. Despite a soaring stock market and steady economic growth, many workers are returning to temporary or part-time jobs. This trend is intensifying America&apos;s decades-long rise in income inequality, in which low- and middle-income workers have seen their real wages stagnate or decline. On average, temps earn 25 percent less than permanent workers. In Kane County, Illinois, where Rosa lives, one in every 14 workers is a temp. 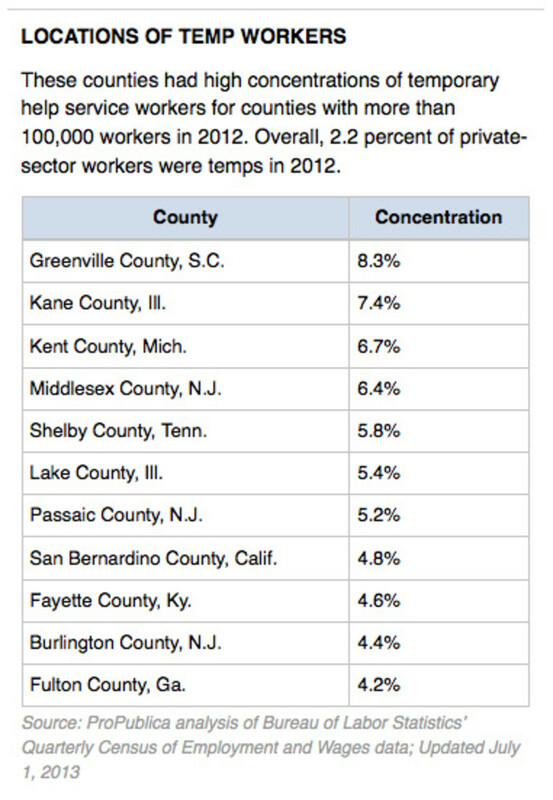 Such high concentrations of temp workers exist in Grand Rapids, Michigan; Middlesex County, New Jersey; Memphis, Tennessee; the Inland Empire of California; and Lehigh County, Pennsylvania. In New Jersey, white vans zip through an old Hungarian neighborhood in New Brunswick, picking up workers at temp agencies along French Street. 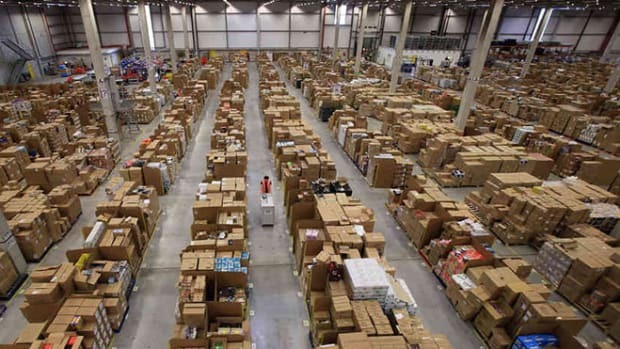 In Joliet, Illinois, one temp agency operated out of a motel meeting room once a week, supplying labor to the layers of logistics contractors at one of Walmart&apos;s biggest warehouses. In Greenville County, South Carolina, near BMW&apos;s U.S. manufacturing plant, one in 12 workers was a temp in 2012. A decade before, it was one in 22. In some lines of work, huge numbers of full-time workers have been replaced by temps. 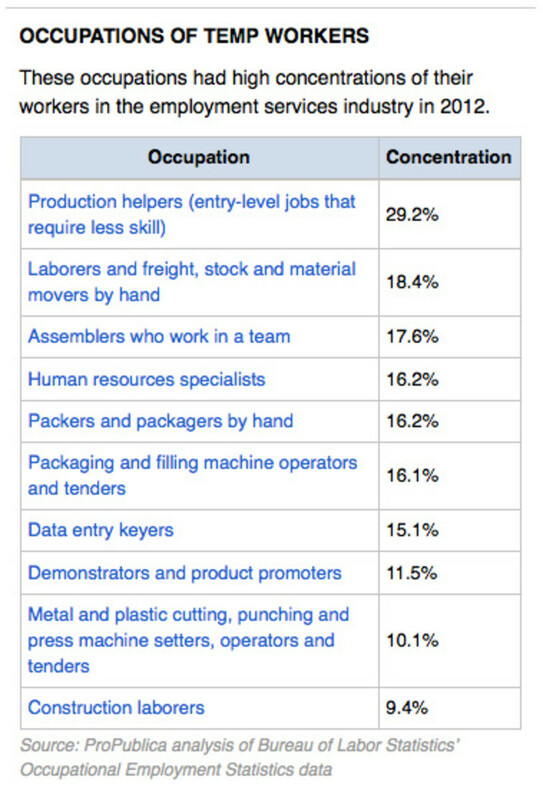 One in five manual laborers who move and pack merchandise is now a temp. As is one in six assemblers who work in a team, such as those at auto plants. To be sure, many temp assignments serve a legitimate and beneficial purpose. Temp agencies help companies weather sudden or seasonal upswings and provide flexibility for uncertain times. Employees try out jobs, gain skills, and transition to full-time work. "I think our industry has been good for North America, as far as keeping people working," said Randall Hatcher, president of MAU Workforce Solutions, which supplies temps to BMW. "I get laid off by Employer A and go over here to Employer B, and maybe they have a job for me. People get a lot of different experiences. An employee can work at four to five different companies and then maybe decide this is what I want to do." Companies like the "flexibility," he added. "To be able to call someone and say, ‘I need 100 people&apos; is very powerful. It allows them to meet orders that they might not otherwise." But over the years, many companies have upended that model and stretched the definition of "temporary work." It is a practice that George Gonos, a sociologist at SUNY-Potsdam who has spent his career studying the temp industry, calls the modern version of the "shape-up"—a practice in which longshoremen would line up in front of a boss, who would pick them one by one for work on the docks. The day after Thanksgiving 1960, Edward R. Murrow broadcast a report called "Harvest of Shame," documenting the plight of migrant farmworkers. Temp workers today face many similar conditions in how they get hired, how they get to work, how they live, and what they can afford to eat. Adjusted for inflation, those farmworkers earned roughly the same 50 years ago as many of today&apos;s temp workers, including Rosa. In fact, some of the same farm towns featured in Murrow&apos;s report have now been built up with warehouses filled with temps. As before, the products change by the season. But now, instead of picking strawberries, tomatoes, and corn, the temp workers pack chocolates for Valentine&apos;s Day, barbecue grills for Memorial Day, turkey pans for Thanksgiving, clothing and toys for Christmas. African-Americans make up 11 percent of the overall workforce but more than 20 percent of temp workers. Willie Pearson, who is African-American, has been a full-time worker at BMW&apos;s South Carolina plant for 14 years. But since at least 2005, he said, he hasn&apos;t seen anyone who&apos;s "been hired straight on. It&apos;s all been through temporary agencies." The company says "after six months they can hire them," he said, "but I&apos;d say it&apos;s only one out of five" who actually lands a full-time job. Latinos make up about 20 percent of all temp workers. In many temp towns, agencies have flocked to neighborhoods full of undocumented immigrants, finding labor that is kept cheap in part by these workers&apos; legal vulnerability: They cannot complain without risking deportation. Many people believe that the use of temp workers simply grew organically, filling a niche that companies demanded in an ever-changing global economy. But decades before "outsourcing" was even a word, the temp industry campaigned to persuade corporate America that permanent workers were a burden. The industry arose after World War II as the increase in office work led to a need for secretaries and typists for short assignments. At the time, nearly every state had laws regulating employment agents in order to stop the abuses of labor sharks, who charged exorbitant fees to new European immigrants in the early 1900s. Presenting temp work as a new industry, big temp firms successfully lobbied to rewrite those laws so that they didn&apos;t apply to temp firms. In the 1960s, agencies such as Kelly Services and Manpower advertised their services as women&apos;s work, providing "pin money" to housewives, according to Erin Hatton, a SUNY Buffalo sociologist and author ofThe Temp Economy. And they marketed the advantages of workers that the host company wasn&apos;t responsible for—a theme that continues today. The temp industry boomed in the 1990s, as the rise of just-in-time manufacturing drove just-in-time labor. But it also gained by promoting itself as the antidote to bad publicity over layoffs. If a company laid off a large portion of its workforce, it could make big news and leave customers feeling sour. But if a company simply cut its temps, it was easy to write it off as seasonal—and the host company could often avoid the federal requirement that it notify workers of mass layoffs in advance. "I worked in a poultry plant and a restaurant at the same time so I could get enough money to send back to Mexico," she said. Like Rosa, many undocumented immigrants who spoke for this story landed full-time jobs when they first arrived in the 1990s. But many of them lost their jobs when factories closed during the recent recession and have since found only temp work. Another temp worker, Judith Iturralde, traced the shift back even earlier, to the immigration crackdowns after 9/11. She said that after she returned to work from surgery in 2002, the compact-disc warehouse she worked at told her it could no longer employ her because she didn&apos;t have papers. They directed her to a temp firm, she said, and a few years later, she returned to the same warehouse, still undocumented. It is now 5:03 a.m. at Staffing Network, and the first batch of workers waits outside to board the school bus for Norelco. The agency said it offers complimentary transportation for its employees&apos; benefit. But worker advocates say vans help the temp agencies by ensuring they provide their corporate clients with the right number of workers at the right time. Many metro areas don&apos;t have adequate transportation from the working-class neighborhoods to the former farmland where warehouses have sprouted over the past 15 years. So a system of temp vans has popped up, often contracted by the agencies. Workers in several cities said they feel pressured to get on the vans or lose the job. They usually pay $7 to $8 a day for the round trip. "They push and push us in until we get like cigarettes in a box," said one Illinois worker. "Sometimes I say, ‘Hey, you are not driving goats!&apos;"
"We were getting hungry and thirsty, and we could barely walk, and our feet were hurting," Ramos said. "They still charged us for the ride." 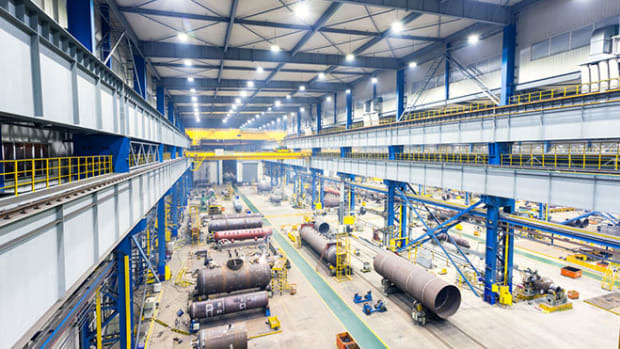 It is now 5:20 a.m., and a second batch of workers has been called for Norelco. Dispatchers are starting to tap workers for Start Sampling, which provides free samples of items like shampoos, coffee, and cat food on behalf of retailers and consumer product companies. The dispatchers have called several other workers named Rosa. Each time, her ears perk up, but it is always another last name. She goes to the counter and asks the dispatchers if they think there will be work today. They tell her there&apos;s not much but to wait a little longer in case a company calls to say they need more bodies. Two months before, in November, Rosa walked into the temp agency with something to say. She had been attending meetings of the Chicago Workers&apos; Collaborative, a non-profit that advocates for temp workers and is funded by various religious and anti-poverty foundations. Though Rosa became increasingly active, her only source of income is temp jobs. "My name is Rosa Ramirez," she said, flanked by leaders of the workers collaborative, who recorded the speech on a cell phone. "We wanted to read some points that we want to change here in this office." "Stop forcing workers to wait without pay before the work shift," Rosa said, standing in the center of the room and reading from a paper she had brought. "Allow workers to go directly to the worksite, because some people have children, and they can&apos;t find care that early." Rosa read on. "Don&apos;t force employees to wait outside of the office until transportation arrives during the winter months." "We don&apos;t want to be loaded into trucks or vans," Rosa said. "Because they carry us like sardines." "I no longer could stand the abuses," Rosa said. "I see people accepting them, and so I thought by standing up and speaking, I was hoping that people would join me and would agree and would stand up for themselves. But unfortunately, the majority of the people did not." Staffing Network said in a statement that workers weren&apos;t required to come to the branch office. Many workers, it said, get hired by calling about job opportunities and then go directly to their worksites. 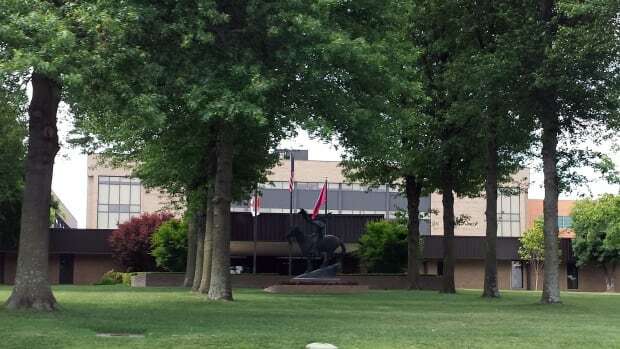 "Our track record of being a fair and lawful employer is evidenced by the fact that more than 65 percent of the temporary employees we hire and place have worked with Staffing Network for one year or more," the company wrote. "We provide all employees opportunities to voice any questions or concerns about any aspects of their jobs—without any retaliation." Unions, on the ropes nationwide, have historically done little for temp workers. The temp industry initially won union backing by promising never to cross picket lines. But in 1985, the Federal Trade Commission ruled that the trade association could not force its members to honor that pledge; so they didn&apos;t.
"Unions have had two souls when it comes to temp workers," said Harley Shaiken, a longtime labor economist at the University of California-Berkeley. One is to try to include them, he said, but "the other is circle the wagons, protect the full-time workers that are there." Some temp firms have even promoted themselves as experts at maintaining a union-free workplace. In a proposal for the off-road vehicle maker Polaris, the temp agency Westaff, a division of the Select Family of Staffing Companies, said its team was specially trained to spot early warning signs of union activity, such as "groups of workers huddling, then quieting when managers appear." Meanwhile, a whole ecosystem of contractors and subcontractors benefits from the flexibility of just-in-time labor. For example, Walmart&apos;s two largest warehouse complexes are southwest of Chicago and in the Inland Empire east of Los Angeles. Both are managed by Schneider Logistics, which in turn subcontracts to an ever-changing cast of third-party logistics firms and staffing companies. Such layers of temp agencies have helped Walmart avoid responsibility when regulators have uncovered problems or when workers have tried to sue, accusing the company of wage or safety violations. For example, when California inspected Walmart&apos;s Inland Empire warehouse in 2011 and found that workers were being paid piece-rate according to how many shipping containers they unloaded, rather than by the hour, regulators issued more than $1 million in fines against the subcontractors for failing to show how the pay was calculated. Neither Walmart nor Schneider faced penalties. Asked if the layers of subcontracting allow Walmart to escape blame, spokeswoman Brooke Buchanan said, "Absolutely not." "We work very hard to abide by the law," she said, "and we expect all the businesses that we do business with and that they do business with to comply with the law." Schneider treats its associates with "dignity and respect," spokeswoman Janet Bonkowski wrote in an email. "Our suppliers are independent," she said. "When we utilize third-party vendors, we contractually require full compliance with all required laws and that all parties conduct business ethically." Berto Gutierrez, who has worked several stints at the Walmart warehouse in Elwood, Illinois, provided ProPublica with a copy of a 2011 paycheck from subcontractor Eclipse Advantage. The check shows he was paid only $57.81 for 12.5 hours of work, or $4.62 an hour. Neither Eclipse, Schneider, nor Walmart provided an explanation for Gutierrez&apos;s paycheck. In 2007, Leticia Rodriguez was hired directly by Simos, the logistics contractor running the online part of Walmart&apos;s Elwood warehouse. She said she worked as a supervisor on an annual contract for $49,500 a year, with health insurance. In 2009, when she declined to come in on what she described as a long-awaited day off, she was fired. Rodriguez returned to the warehouse six months later, this time starting at the bottom, loading trucks for one of Schneider&apos;s staffing companies. She said she was paid $15 an hour, but within a year the staffing company lost the contract. Eclipse&apos;s president, David Simono, declined to comment. Simos didn&apos;t return calls. Walmart said it couldn&apos;t comment on the specifics of a subcontractor&apos;s employee but said it provides all its workers opportunities for growth. The growing temporary sector does little to sustain workers&apos; standard of living. Temp agencies consistently rank among the worst large industries for the rate of wage and hour violations, according a ProPublica analysis of federal enforcement data. A 2005 Labor Department survey, the most recent available, found that only four percent of temps have pensions or retirement plans from their employers. Only eight percent get health insurance from their employers, compared with 56 percent of permanent workers. What employers don&apos;t provide, workers get from the social safety net, i.e., taxpayers. And don&apos;t look for Obamacare to fix it. Under the law, employers must provide health coverage only to employees who average 30 hours a week or more. After pressure from the temp industry and others, the IRS ruled that companies have up to a year to determine if workers qualify. With the major provisions of health-care reform set to take effect in 2014, there&apos;s growing evidence that 2013 is becoming a boom year for temping out. TempWorks, which sells software that keeps track of payroll and worker orders, says sales to staffing agencies have been going through the roof and that temp firms tell them the uptick is because of Obamacare. In April, the federal Occupational Safety and Health Administration announced an initiative to get better information on temp-worker safety. "Employers, we think, do not have the same commitment to providing a safe workplace, to providing the proper training, to a worker who they may only be paying for a few weeks." OSHA director David Michaels said in an interview. "I mean, we&apos;ve seen just ghastly situations." 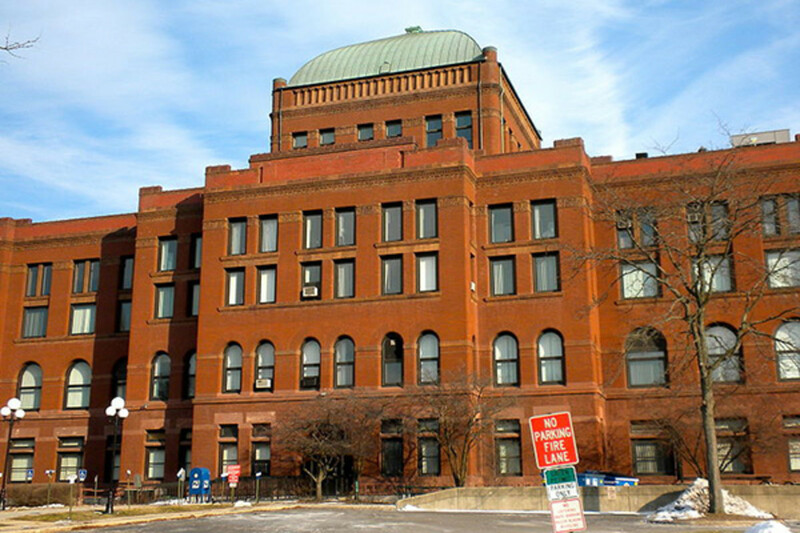 In December 2011, a Chicago temp worker died after he was scalded by a citric acid solution. The skin cream and shampoo factory he was assigned to failed to call 911 even as his skin was peeling from his body. In August 2012, a Jacksonville temp was crushed to death on his first day of work at a bottling plant when a supervisor told him to clean glass from underneath a machine that stacks goods onto pallets—a job that OSHA said he wasn&apos;t trained to do. And in January, a temp was killed at a paper mill outside Charlotte, North Carolina, when he was overcome by toxic fumes while cleaning the inside of a chemical tank. "There&apos;s something going on here that needs direct intervention," Michaels said. That law requires temp agencies to give workers written notice of the basics: whom they will work for, how much they&apos;ll be paid, and what safety equipment they&apos;ll need. The law limits transportation costs and prohibits fees that would push workers&apos; pay below minimum wage. Agencies must also reimburse the worker if they are sent to a worksite only to find out there is no job for them there. Similar state bills have passed in New Jersey and Illinois in the past few years. But while the American Staffing Association has a code of ethics containing similar guidelines, it has fought against such laws and blocked them in California and New York. "All laws that apply to every other employee apply to temporary workers," said Stephen Dwyer, the group&apos;s general counsel. "We thought that heaping new laws on top of existing laws would not be effective." Even in states that have them, the laws are honored mostly in the breach. For example, Illinois prohibits temp agencies from charging for transportation. But many have gotten around the law by using so-called raiteros, who act as neighborhood labor brokers for the agencies and charge for transportation. The law also requires an employment notice stating the name of the host company, the hourly wage, and any equipment needed. Out of more than 50 Chicago-area workers interviewed for this story, only a handful had ever received one. Passing through Chicago&apos;s working-class suburbs recently, Rosa pointed out the car window to a row of small redbrick homes. "I&apos;ve always dreamed of having a little house, a really small, little house," she said. Asked if she thought she&apos;d ever be able to buy one, Rosa laughed. "Earning $8.25 an hour?" she said. "I don&apos;t think I&apos;ll ever be able to do that."